It seems as though we have become slightly obsessed with styling and what's even more ridiculous is that we style so it looks "natural" or not obviously styled. I am definitely guilty of placing my throw so it looks like it has just casually been thrown there when in fact it took three tries to get it to "look natural". I also commit this crime on Instagram and definitely when it comes to bookcases, coffee tables and consoles. I tend to follow a few rules or tips but I think what is most important is that the pieces either serve a purpose or are something you truly love. 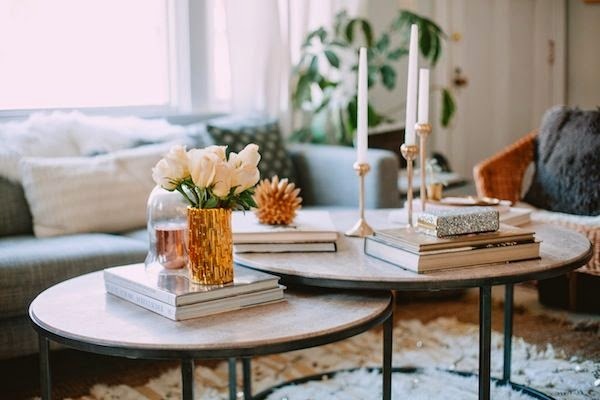 Shop some of my favourite pieces for a stylish coffee table below and see my tips for styling your coffee table. 1. Natural elements such as a flowers to add colour and bring the outdoors in. 2. Candles which add both ambience and scent to the room when lit. 3. Books to add height, interest and entertain visitors. 5. Anything that you love - whether it be something you collect such as shells or matchboxes or a precious stone or trinket box. Visit Archers Hall on Facebook to see their table top picks and shop the look in their Speightstown design centre.